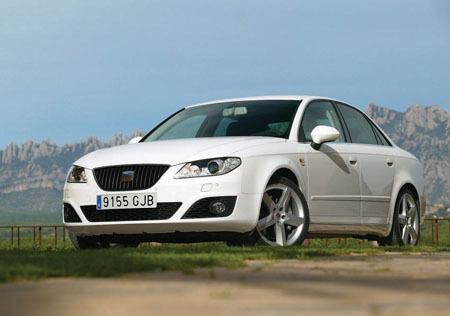 Seat’s new Exeo saloon is on the way. It will compete in the upper medium segment when it arrives in showrooms in late spring. Described by Seat as an elegant five-seat saloon, it promises premium quality and exceptional levels of standard equipment, alongside a healthy dose of the Spanish carmaker's trademark sporting character. It should arrive with an initial choice of three engines. All Euro V-compliant, the powerplant selection include a brace of hi-tech common rail turbodiesels producing 143bhp or 170bhp, as well as a potent 200bhp turbocharged petrol. They are all mated, as standard, to a six-speed manual gearbox and all endow the Exeo with spirited performance. At launch, the new Seat saloon’s 0 to 62mph times range from 9.2 seconds (for the 143bhp TDI ), 8.4 seconds for the 170 PS TDI, and a distinctly spirited 7.3 seconds for the 200bhp TSI petrol-powered version. Maximum speeds, where legal (on autobahns and racing circuits ), are 133mph, 142mphm and 149mph respectively. Fuel economy and exhaust emissions, both important considerations for private and business buyers alike in today’s straitened circumstances, are commendable. Depending on engine, the Exeo is capable of up to 51.4mpg (on the combined cycle ) with an official CO2 emissions figure of as little as 143g/km. Word from Europe is that safety and security are comprehensively catered for as ESP and EBA are universal features, likewise active front head restraints, rear-seat ISOFIX points with Top Tether, six airbags, volumetric alarm with tilt sensor, and remote central locking. Seat says that quality, at every step of the car’s design and construction, is a key advantage for the Exeo as it prepares to make its debut. Meticulous attention to detail, allied to that generous standard equipment, combine to give the four-door a touch of real luxury. More details on the Exeo closer to the launch here in late spring.